Bride Charlotte had her awesome Back to the Future themed painted wedding shoes featured in "Say Yes to the Dress UK" Season 2 episode 4 which aired in May! I am thrilled to announce Beautiful Moment hand painted shoes and artworks have been announced as a finalist for the Best Finishing Touches award at the 2017 British Wedding Industry Awards to be announced February 15th. "The British Wedding Awards is considered the must-go-to event for top decision makers in the British bridal industry. Recognised by the trade and consumers alike as the ‘Baftas’ of the wedding world; this event boasts an enviable guest list and will reveal the award-winning brands and products who won over the UK’s brides in this year’s fiercely competitive voting." Full page feature on matching your Beautiful Moment hand painted wedding shoes to your theme in issue 168 of wedding ideas magazine! 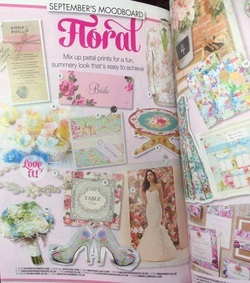 July edition of Wedding Ideas magazine showcases these boho floral shoes. Beautiful Moment hand painted wedding shoes can be seen in the current issue of the UK's no. 1 selling Bridal magazine "Brides" on sale this February/March. 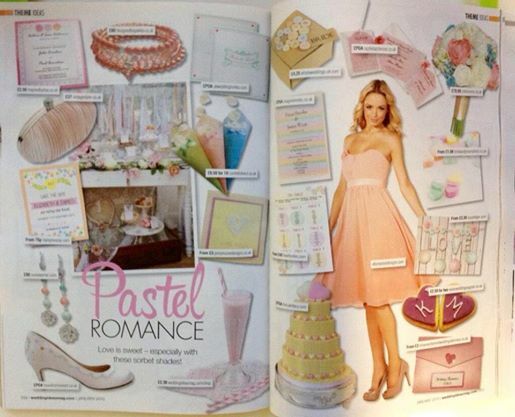 Three wonderful inclusions in the February 2015 Wedding ideas magazine! Beautiful Moment was nominated in the best Special touches category in the British wedding awards! Thank you to everyone who voted. The fab hand painted wedding shoes created for this bride were featured in the Wedding ideas "Real Brides"
This new issue of Wedding carries an ad for Beautiful Moment painted Bridal shoes and will be handed out at the National Wedding show! 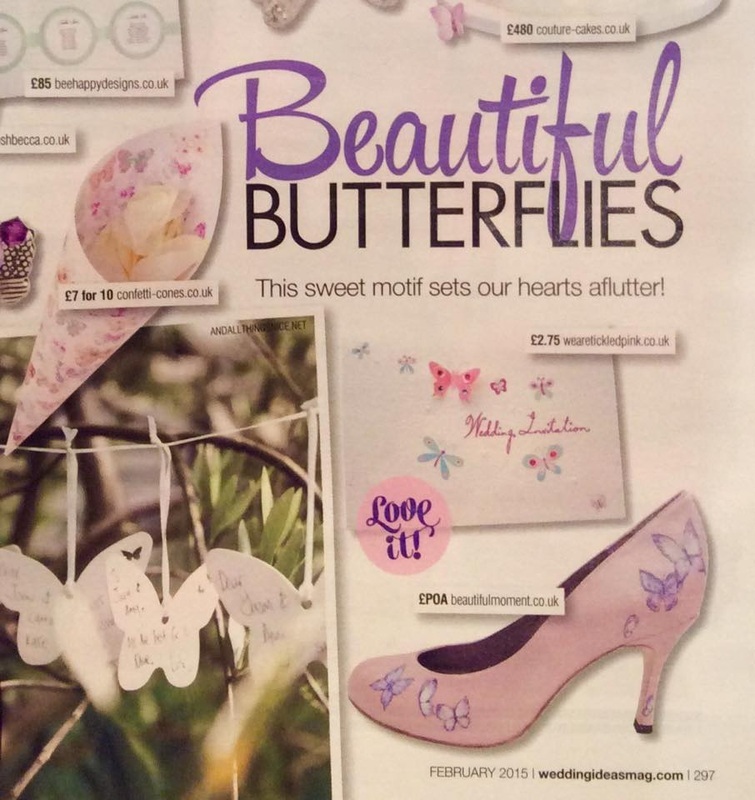 See the new October issue of Wedding Ideas magazine where Beautiful Moment hand painted wedding shoes are recommended in the Wedding Wishlist! 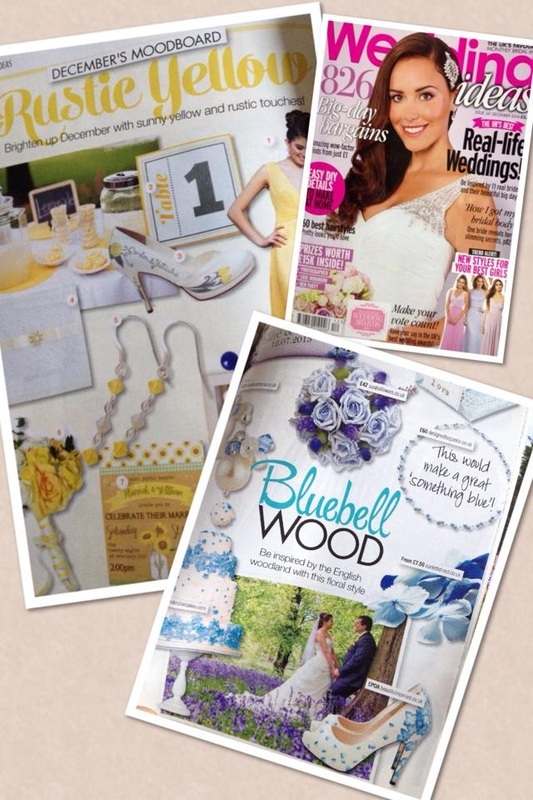 Beautiful Moment shoes can be seen in the current issue of Wedding Ideas Magazine in the September Mood Board. 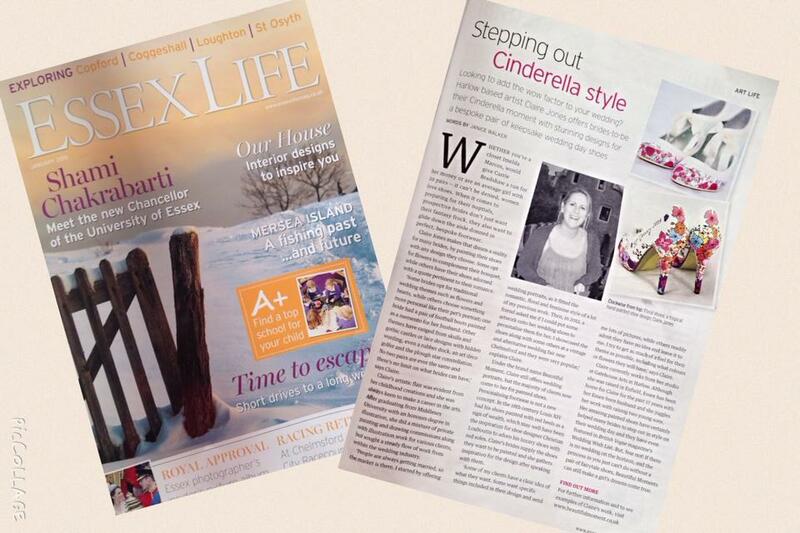 The Butterfly shoes I collaborated on with Shoe designer of the year Marsha Hall were featured in the August issue of "Your London Wedding" magazine as part of a fairytale shoot. Beautiful Moment teamed up with some other great Wedding suppliers on an extra special photoshoot by Ikon Works photography.Click here to see the Helen photoshoot and the story behind it. I'm excited to tell everyone that Beautiful Moment is in the November Issue of British VOGUE!! They sent me this lovely email which I've posted part of below and I'm thrilled to be endorsed by such an iconic fashion publication! "As I am sure you are aware, Vogue is renowned for championing luxury, world-class businesses within its editorial pages. We are specifically looking for unique companies that will appeal to our stylish and affluent audience and we feel that Beautiful Moment most definitely meets the necessary high criteria." Thank you to everyone who recently voted in the wedding industry experts awards and got Beautiful Moment the title Best Shoe Designer in Essex and also best in South East England! Beautiful Moment's ranking was also 5th out of 100 entrants worldwide so it just shows how well supported the designs are so THANKS! V is for Vibrant! 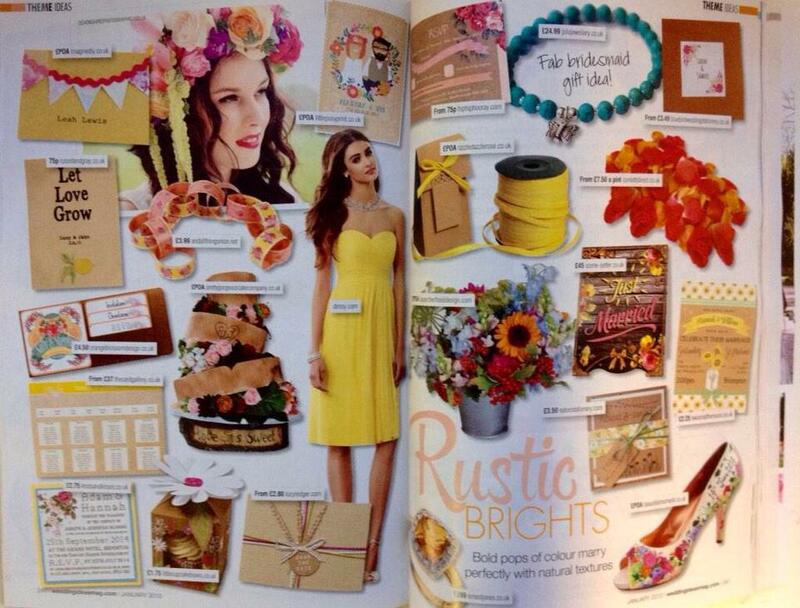 Featured in Wedding Ideas Magazine September 2013 Issue! GALLERY EXHIBITION a pair of my shoes and a portrait print are on show in the latest exhibition at the Gatehouse Arts Gallery in Harlow until July 27th tues-sat 11am-4pm. Beautiful Moment goes global! Hand painted wedding shoes and artworks on our first international blog at Hochzeitum3 Austria. 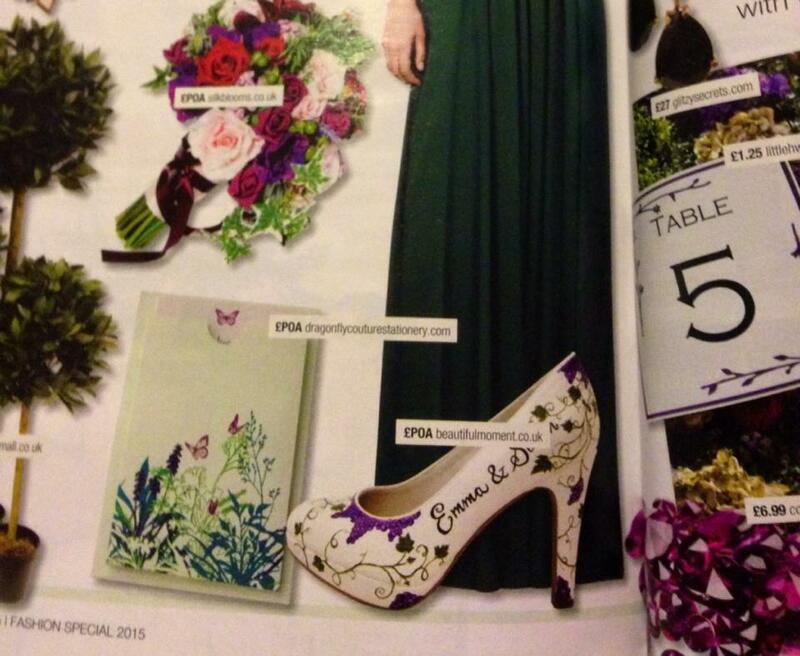 Beautiful Moment hand painted wedding shoes were featured on Wedding Ideas magazines May wish list! Blog Post A Vintage wedding Guide had my Hand painted wedding shoes as its Feature Friday article. Blog post on Alice in Weddingland Butterflies and Ballerinas see my Butterfly shoes amongst the lovely photographs by Icy Lazare. Take a look at the new blog post featuring my Cinderella shoes here on the B.loved wedding blog! New style illustrations! I recently provided this fashion style illustration for new online wedding magazine Alice for the editors page. If this is something you would like of you in your dress let me know! Collaboration with Marsha Hall Handmade shoes! Great new blog post here from Kalli Weddings on my shoes. Check out the blog post featuring My wedding shoes over on WeddingDates.ie, the popular wedding website which allows you to search for your wedding venue by date. At the Wedding Ideas Magazine Awards 2013 with fellow Essex Wedding suppliers. Mrs P and P Blog post!